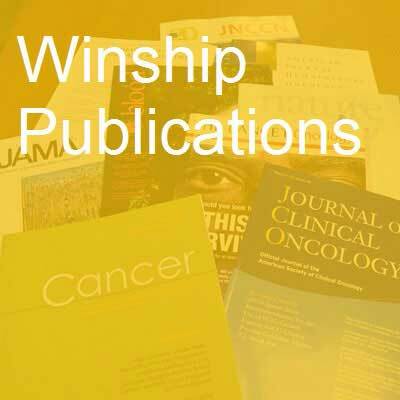 Various first authors and senior authors from Winship Cancer Institute have published 62 studies in major medical and scientific journals in the past month. Aquaporins: Their role in gastrointestinal malignancies. Nagaraju GP, Basha R, Rajitha B, Alese OB, Alam A, Pattnaik S, El-Rayes B. Cancer letters. 2016; 373(1):12-8. PubMed PMID: 26780474. Ductal Carcinoma In Situ of the Breast: Should Breast Irradiation Be Routinely Added to Surgical Excision? Wood WC. Journal of oncology practice / American Society of Clinical Oncology. 2016; 12(4):309-11. PubMed PMID: 27072386. Hydrogen peroxide and central redox theory for aerobic life: A tribute to Helmut Sies: Scout, trailblazer, and redox pioneer. Jones DP. Archives of biochemistry and biophysics. 2016; 595:13-8. PubMed PMID: 27095208. Insuring Women in the United States Before, During, and After Pregnancies. Adams EK, Johnston EM. American journal of public health. 2016; 106(4):585-586. PubMed PMID: 26959251. Myeloma Is Not a Single Disease. Lonial S, Nooka AK. Journal of oncology practice / American Society of Clinical Oncology. 2016; 12(4):287-92. PubMed PMID: 27072380. Postoperative atrial arrhythmias: Where do we go from here? Fernandez FG. The Journal of thoracic and cardiovascular surgery. 2016; 151(4):990-991. PubMed PMID: 26778377. Prognostic significance of morphological growth patterns and mitotic index of epithelioid malignant peritoneal mesothelioma. Krasinskas AM, Borczuk AC, Hartman DJ, Chabot JA, Taub RN, Mogal A, Pingpank J, Bartlett D, Dacic S. Histopathology. 2016; 68(5):729-737. PubMed PMID: 26272336. The Management of Breast Cancer Detected by Reduction Mammaplasty. Carlson GW. Clinics in plastic surgery. 2016; 43(2):341-7. PubMed PMID: 27012792. Too big, too small, or just right. Fernandez FG. The Journal of thoracic and cardiovascular surgery. 2016; 151(4):1170. PubMed PMID: 26778379. Salivary Intercalated Duct Lesions in Transition. Magliocca KR, Seethala RR. Histopathology. 2016; PubMed PMID: 27060355. The role of adiponectin in obesity-associated female-specific carcinogenesis. Nagaraju GP, Rajitha B, Aliya S, Kotipatruni RP, Madanraj AS, Hammond A, Park D, Chigurupati S, Alam A, Pattnaik S. Cytokine & growth factor reviews. 2016; PubMed PMID: 27079372. Use of a Grant Writing Class in Training PhD Students. Kahn RA, Conn GL, Pavlath GK, Corbett AH. Traffic (Copenhagen, Denmark). 2016; PubMed PMID: 27061800. Dual Epidermal Growth Factor Receptor and Human Epidermal Growth Factor Receptor 2 Inhibition in Squamous Cell Carcinoma of the Head and Neck; Is the Jury Still Out? Saba NF, Wong SJ. Journal of clinical oncology : official journal of the American Society of Clinical Oncology. 2016; PubMed PMID: 27069073. Phase II evaluation of sunitinib in the treatment of recurrent or refractory high-grade glioma or ependymoma in children: a children's Oncology Group Study ACNS1021. Wetmore C, Daryani VM, Billups CA, Boyett JM, Leary S, Tanos R, Goldsmith KC, Stewart CF, Blaney SM, Gajjar A. Cancer medicine. 2016; PubMed PMID: 27109549. Determination of Resectability. Ethun CG, Maithel SK. The Surgical clinics of North America. 2016; 96(2):163-81. PubMed PMID: 27017857. Emesis as a Screening Diagnostic for Low Dose Rate (LDR) Total Body Radiation Exposure. Camarata AS, Switchenko JM, Demidenko E, Flood AB, Swartz HM, Ali AN. Health physics. 2016; 110(4):391-4. PubMed PMID: 26910032. Neoadjuvant chemoradiation followed by orthotopic liver transplantation in cholangiocarcinomas: the emory experience. Marchan EM, Landry JC. Journal of gastrointestinal oncology. 2016; 7(2):248-54. PubMed PMID: 27034793. Perfluorooctanoic acid exposure and natural menopause: A longitudinal study in a community cohort. Dhingra R, Darrow LA, Klein M, Winquist A, Steenland K. Environmental research. 2016; 146:323-30. PubMed PMID: 26802619. Prevalence of Transgender Depends on the "Case" Definition: AÂ Systematic Review. Collin L, Reisner SL, Tangpricha V, Goodman M. The journal of sexual medicine. 2016; 13(4):613-626. PubMed PMID: 27045261. Response. Lee FE, Aufferman W, Berkowitz D. Chest. 2016; 149(4):1110. PubMed PMID: 27055708. Salivary secretory leukocyte protease inhibitor (SLPI) and head and neck cancer: The Cancer Prevention Study II Nutrition Cohort. Pierce Campbell CM, Giuliano AR, Torres BN, O'Keefe MT, Ingles DJ, Anderson RL, Teras LR, Gapstur SM. Oral oncology. 2016; 55:1-5. PubMed PMID: 27016010. Surgical Management of Pancreatic Neuroendocrine Tumors. Chiruvella A, Kooby DA. Surgical oncology clinics of North America. 2016; 25(2):401-21. PubMed PMID: 27013372. Use of a Fitness Tracker to Promote Physical Activity in Children With Acute Lymphoblastic Leukemia. Hooke MC, Gilchrist L, Tanner L, Hart N, Withycombe JS. Pediatric blood & cancer. 2016; 63(4):684-9. PubMed PMID: 26756736. A Framework for 3D Vessel Analysis using Whole Slide Images of Liver Tissue Sections. Liang Y, Wang F, Treanor D, Magee D, Roberts N, Teodoro G, Zhu Y, Kong J. International journal of computational biology and drug design. 2016; 9(1-2):102-119. PubMed PMID: 27034719. RSK2 signals through stathmin to promote microtubule dynamics and tumor metastasis. Alesi GN, Jin L, Li D, Magliocca KR, Kang Y, Chen ZG, Shin DM, Khuri FR, Kang S. Oncogene. 2016; PubMed PMID: 27041561. Anti-3-[18F] FACBC (Fluciclovine) PET-CT of Breast Cancer An Exploratory Study. Tade FI, Cohen MA, Styblo TM, Odewole OA, Holbrook AI, Newell MS, Savir-Baruch B, Li XB, Goodman MM, Nye JA, Schuster DM. Journal of nuclear medicine : official publication, Society of Nuclear Medicine. 2016; PubMed PMID: 27056619. Microenvironmental regulation of hematopoietic stem cells and its implications in leukemogenesis. Seshadri M, Qu CK. Current opinion in hematology. 2016; PubMed PMID: 27071022. Current Opinion on the Oncoplastic Approach in the USA. Losken A, Kapadia S, Egro FM, Baecher KM, Styblo TM, Carlson GW. The breast journal. 2016; PubMed PMID: 27060905. Inhibition of NF-ÎºB translocation by curcumin analogs induces G0/G1 arrest and downregulates thymidylate synthase in colorectal cancer. Rajitha B, Belalcazar A, Nagaraju GP, Shaib WL, Snyder JP, Shoji M, Pattnaik S, Alam A, El-Rayes BF. Cancer letters. 2016; 373(2):227-33. PubMed PMID: 26850372. Pediatric Meckel's Diverticulum: Report of 208 Cases and Review of the Literature. Francis A, Kantarovich D, Khoshnam N, Alazraki AL, Patel B, Shehata BM. Fetal and pediatric pathology. 2016; :1-8. PubMed PMID: 27064958. Epigenetic Biomarkers of Preterm Birth and Its Risk Factors. Knight AK, Smith AK. Genes. 2016; 7(4). PubMed PMID: 27089367. Focal Photodamage on the Occipital Scalp. Yeung H, Luk KM, Chen SC. JAMA dermatology. 2016; PubMed PMID: 27074250. Super-Resolution Ultrasound Imaging in Vivo with Transient Laser-Activated Nanodroplets. Luke GP, Hannah AS, Emelianov SY. Nano letters. 2016; 16(4):2556-9. PubMed PMID: 27035761. Approach to a Child with Colitis. Palle SK, Prasad M, Kugathasan S. Indian journal of pediatrics. 2016; PubMed PMID: 27080713. Chromodomain-helicase-DNA binding protein 5, 7 and pronecrotic mixed lineage kinase domain-like protein serve as potential prognostic biomarkers in patients with resected pancreatic adenocarcinomas. Seldon CS, Colbert LE, Hall WA, Fisher SB,Yu DS, Landry JC. World journal of gastrointestinal oncology. 2016; 8(4):358-65. PubMed PMID: 27096031. Factors affecting the Persistence of Drug-induced Reprogramming of the Cancer Methylome. Bell JS, Kagey JD, Barwick BG, Dwivedi B, McCabe MT, Kowalski J, Vertino PM. Epigenetics. 2016; :0. PubMed PMID: 27082926. CD30+ Cutaneous T Cell Lymphoma: Response to Rotational Total Skin Electron Irradiation. Danish HH, Heumann TR, Bradley KT, Switchenko J, Esiashvili N, Lechowicz MJ, Flowers CR, Khan MK. Dermatology and therapy. 2016; PubMed PMID: 27085537. Cytologic features of angiosarcoma: A review of 26 cases diagnosed on FNA. Geller RL, Hookim K, Sullivan HC, Stuart LN, Edgar MA, Reid MD. Cancer cytopathology. 2016; PubMed PMID: 27088896. Recurrent prostate cancer detection with anti-3-[(18)F]FACBC PET/CT: comparison with CT. Odewole OA, Tade FI, Nieh PT, Savir-Baruch B, Jani AB, Master VA, Rossi PJ, Halkar RK, Osunkoya AO, Akin-Akintayo O, Zhang C, Chen Z,Goodman MM, Schuster DM. European journal of nuclear medicine and molecular imaging. 2016; PubMed PMID: 27091135. Paleolithic and Mediterranean Diet Pattern Scores Are Inversely Associated with Biomarkers of Inflammation and Oxidative Balance in Adults. Whalen KA, McCullough ML, Flanders WD, Hartman TJ, Judd S, Bostick RM. The Journal of nutrition. 2016; PubMed PMID: 27099230. B cells gone rogue: the intersection of diffuse large B cell lymphoma and autoimmune disease. Koff JL, Flowers C. Expert review of hematology. 2016; PubMed PMID: 27098121. Erectile Dysfunction in Male Survivors of Childhood Cancer-A Report From the Childhood Cancer Survivor Study. Ritenour CW, Seidel KD, Leisenring W, Mertens AC, Wasilewski-Masker K, Shnorhavorian M, Sklar CA, Whitton JA, Stovall M, Constine LS, Armstrong GT, Robison LL, Meacham LR. The journal of sexual medicine. 2016; PubMed PMID: 27117527. Validation of cutaneous lymphoma international prognostic index (CLIPI) for mycosis fungoides and SÃ©zary syndrome. Danish HH, Liu S, Jhaveri J, Flowers CR, Lechowicz MJ, Esiashvili N, Khan MK. Leukemia & lymphoma. 2016; :1-7. PubMed PMID: 27104864. Interpretations of education about gene-environment influences on health in rural Ethiopia: the context of a neglected tropical disease. Tora A, Ayode D, Tadele G, Farrell D, Davey G, McBride CM. International health. 2016; PubMed PMID: 27114426. Computer-aided Detection of Prostate Cancer with MRI:: Technology and Applications. Liu L, Tian Z, Zhang Z, Fei B. Academic radiology. 2016; PubMed PMID: 27133005. Dietary Iron and Colorectal Cancer Risk: A Review of Human Population Studies. Ashmore JH, Rogers CJ, Kelleher SL, Lesko SM, Hartman TJ. Critical reviews in food science and nutrition. 2016; 56(6):1012-20. PubMed PMID: 25574701. Mechanically Induced Catalytic Amplification Reaction for Readout of Receptor-Mediated Cellular Forces. Ma VP, Liu Y, Yehl K, Galior K, Zhang Y, Salaita K. Angewandte Chemie (International ed. in English). 2016; 55(18):5488-5492. PubMed PMID: 27038115. Asparagine endopeptidase is an innovative therapeutic target for neurodegenerative diseases. Zhang Z, Xie M, Ye K. Expert opinion on therapeutic targets. 2016; PubMed PMID: 27115710. Estrogen Receptor and Cytokeratin 5 Are Reliable Markers to Separate Usual Ductal Hyperplasia From Atypical Ductal Hyperplasia and Low-Grade Ductal Carcinoma In Situ. Martinez AP, Cohen C, Hanley KZ, Li XB. Archives of pathology & laboratory medicine. 2016; PubMed PMID: 27116088. Rhodium(II)-Catalyzed C-H Functionalization of Electron-Deficient Methyl Groups. Fu L, Guptill DM, Davies HM. Journal of the American Chemical Society. 2016; PubMed PMID: 27064173. Lack of health maintenance examinations and risk in myeloma patients. Tariman JD, Gleason C, Faiman B, Doss D, Catamero D, Bishop-Royse J, Katz M, Kurtin S, Moran D, , Lonial S. Cancer medicine. 2016; PubMed PMID: 27119422. Disease, treatment, and outcome differences between men and women with follicular lymphoma in the United States. Nabhan C, Zhou X, Day BM, Dawson K, Zelenetz AD, Friedberg JW, Cerhan JR, Link BK, Flowers CR. American journal of hematology. 2016; PubMed PMID: 27124800. Transgenic Expression of Human Lysophosphatidic Acid Receptor LPA2 in Mouse Intestinal Epithelial Cells Induces Intestinal Dysplasia. Yoshida M, He P, Yun CC. PloS one. 2016; 11(4):e0154527. PubMed PMID: 27124742. Novel synthetic curcumin analogs as potent antiangiogenic agents in colorectal cancer. Rajitha B, Nagaraju GP, Shaib WL, Alese OB, Snyder JP, Shoji M, Pattnaik S, Alam A, El-Rayes BF. Molecular carcinogenesis. 2016; PubMed PMID: 27128654. Impact of Isotope Dilution Mass Spectrometry (IDMS) Standardization on Carboplatin Dose and Adverse Events. Lawson J, Switchenko JM, McKibbin T, Harvey RD. Pharmacotherapy. 2016; PubMed PMID: 27130286.